Mendrisio / Zurich: Sealed off by grey concrete walls and barbed wire, the workmen in protective glasses and steel-toed boots at this smelter cannot work fast enough to meet demand from the nervous rich for gold. “I have been in the gold business for 30 years and I have never experienced anything like this," said Bernhard Schnellmann, director for precious metal services at the refiner Argor-Heraeus, one of the world’s three largest. “Production has dramatically increased since the middle of the year. We cannot cope with demand," said Schnellman, wearing a gold watch on his wrist. Spot gold hit a record $1,030.80 (about Rs41,900 then) an ounce on 17 March . It fell below $700 in late October, partly because investors sold their holdings to cover losses in equity and bond markets hit by the credit crisis, and is now around $830 an ounce. The trigger for the price to rise again could come from a much weaker dollar, making gold cheaper for holders of other currencies, and a renewed aversion to paper assets as governments and central banks pump large amounts of cash into the economy, stoking inflation. Smoke billows as the molten gold, like glowing butter, is poured. To cool it, the worker drops it into water. It hisses as it hits. 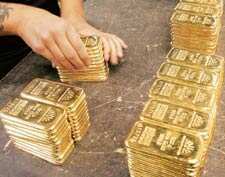 Once hardened in moulds, the gold bars are embossed with the refinery’s seal. Workers wearing white gloves stack them into boxes like domino pieces. Though Switzerland is not a gold miner, it is home to some of the world’s largest refineries, which process an estimated 40% of all newly mined gold. Argor-Heraeus is part-owned by the Austrian Mint and a subsidiary of Germany’s Commerzbank. Commercial and central banks are its chief customers and it says it processes some 350-400 tonnes of gold and 350 tonnes of silver per year. Customers buying gold bars, which can weigh more than 10kg each, have to wait roughly a month, taking into account the year-end holiday season. For those buying coins or ingots, which can fit into the palm of a hand, the delay is six to eight weeks. A year ago, these small products could be had within a couple of days. Worries about the banking system globally have boosted worldwide demand for physical gold, the World Gold Council said. “Many (people) are afraid of leaving their money in banks," said Sandra Conway, managing director at ATS Bullion Ltd in London, which sells bullion and gold coins to institutions and the retail market. “It’s difficult to quantify, but I would say our turnover over the last three months has certainly doubled compared to the previous three months," she said. Other Swiss gold refiners also say business is booming. “Since the summer we have experienced a sharp rise in demand for certain gold products. The one-kilo bar has become very popular," said Fiorenzo Arbini, in charge of health and safety at Pamp, another large Swiss refiner. Schnellmann said the Argor-Heraeus smelter is operating at full capacity, three eight-hour shifts a day. Conquering the backlog by hiring is difficult, because each candidate has to undergo a security check. Switzerland’s largest banks stepped in to replace a void in gold trading while the London gold market was shut after World War II and again during a brief closure in 1968. The former Soviet Union, another top gold producer, chose Zurich banks to handle most of its gold sales in the 1970s and 1980s. “Gold has an image of being the asset of last resort. This could be viewed as old-fashioned but this is how enough people with enough money to matter think," said Stephen Briggs, a metals strategist at RBS Global Banking and Markets. India, China and West Asia remain the biggest gold importers, particularly for jewellery. But demand for physical gold has exploded also in Europe, the Gold Council said. In Switzerland, home to the world’s largest private banking industry, demand for gold bars and coins shot up six fold to 21 tonnes in the third quarter of 2008, more than in any other European country. Retail investment in gold rose 121% in the third quarter of 2008, an important contributor to the overall increase in global demand, the World Gold Council said. In that period purchases of gold bars by retail investors, who often buy through commercial banks, rose nearly 60%, notably in Switzerland, Germany, and the US. There was a surge of interest among professional investors shortly after the collapse of Lehman Brothers Inc. in September. Private bank Julius Baer in October launched a fund to invest exclusively in gold bars stored in highly secured vaults in Switzerland. “The fascination with gold has been there since the beginning of civilization," said Schnellmann. “It cannot be explained: you can’t eat gold, you cannot build anything resistant with it and yet people want to hoard it." Pratima Desai in London contributed to this story.